Every year on May 5th, Japan celebrates Children's Day (Kodomo no hi). Koinobori (鯉のぼり) fish streamers are an integral part of the celebration, being flown from the homes of families with children, as well as throughout the country in popular public gathering places. 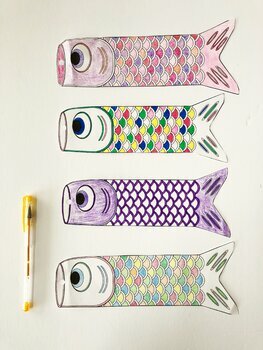 The fish represent strength and bravery as they swim upstream against the strong currents. 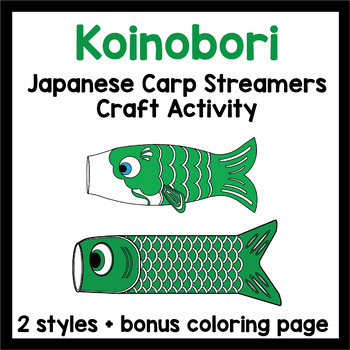 Your students will love participating in this colorful, cultural tradition by creating their own koinobori! This product includes two different templates that your students can color and cut out. You can display these in your classroom on a "pole" (try straws!) or across a piece of string to create an authentic-looking display. 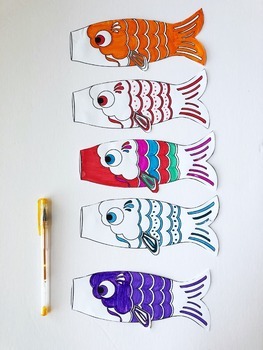 Students of all ages will enjoy creating their own colorful koi flag! 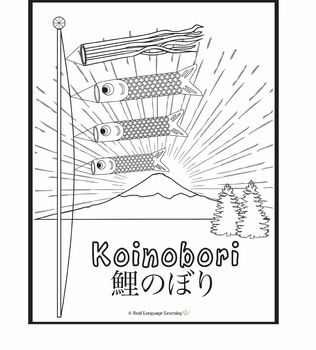 This product also includes a coloring page featuring three koinobori flying on a pole with Mt. Fuji in the background. If you enjoy this product, you might also enjoy my other koinobori craft, "Koinobori flags" made with toilet paper rolls!